For the scientific journal, see The Plant Cell. A large central vacuole, a water-filled volume enclosed by a membrane known as the tonoplast that maintains the cell's turgor, controls movement of molecules between the cytosol and sap, stores useful material and digests waste proteins and organelles. A cell wall composed of cellulose and hemicelluloses, pectin and in many cases lignin, is secreted by the protoplast on the outside of the cell membrane. This contrasts with the cell walls of fungi, which are made of chitin, and of bacteria, which are made of peptidoglycan. Cell walls perform many essential functions: they provide shape to form the tissue and organs of the plant, and play an important role in intercellular communication and plant-microbe interactions. Specialized cell-to-cell communication pathways known as plasmodesmata, pores in the primary cell wall through which the plasmalemma and endoplasmic reticulum of adjacent cells are continuous. Plastids, the most notable being the chloroplast, which contains chlorophyll, a green-colored pigment that absorbs sunlight, and allows the plant to make its own food in the process known as photosynthesis. Other types of plastids are the amyloplasts, specialized for starch storage, elaioplasts specialized for fat storage, and chromoplasts specialized for synthesis and storage of pigments. As in mitochondria, which have a genome encoding 37 genes, plastids have their own genomes of about 100–120 unique genes and, it is presumed, arose as prokaryoticendosymbionts living in the cells of an early eukaryotic ancestor of the land plants and algae. Cell division by construction of a phragmoplast as a template for building a cell plate late in cytokinesis is characteristic of land plants and a few groups of algae, notably the Charophytes and the Chlorophyte Order Trentepohliales. The motile, free-swimming sperm of bryophytes and pteridophytes, cycads and Ginkgo are the only cells of land plants to have flagella similar to those in animal cells, but the conifers and flowering plants do not have motile sperm and lack both flagella and centrioles. Parenchyma cells are living cells that have functions ranging from storage and support to photosynthesis and phloem loading (transfer cells). Apart from the xylem and phloem in their vascular bundles, leaves are composed mainly of parenchyma cells. Some parenchyma cells, as in the epidermis, are specialized for light penetration and focusing or regulation of gas exchange, but others are among the least specialized cells in plant tissue, and may remain totipotent, capable of dividing to produce new populations of undifferentiated cells, throughout their lives. Parenchyma cells have thin, permeable primary walls enabling the transport of small molecules between them, and their cytoplasm is responsible for a wide range of biochemical functions such as nectarsecretion, or the manufacture of secondary products that discourage herbivory. Parenchyma cells that contain many chloroplasts and are concerned primarily with photosynthesis are called chlorenchyma cells. Others, such as the majority of the parenchyma cells in potatotubers and the seedcotyledons of legumes, have a storage function. Collenchyma cells – collenchyma cells are alive at maturity and have only a primary wall. These cells mature from meristem derivatives that initially resemble parenchyma, but differences quickly become apparent. Plastids do not develop, and the secretory apparatus (ER and Golgi) proliferates to secrete additional primary wall. The wall is most commonly thickest at the corners, where three or more cells come in contact, and thinnest where only two cells come in contact, though other arrangements of the wall thickening are possible. 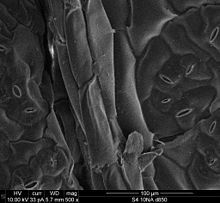 Pectin and hemicellulose are the dominant constituents of collenchyma cell walls of dicotyledonangiosperms, which may contain as little as 20% of cellulose in Petasites. Collenchyma cells are typically quite elongated, and may divide transversely to give a septate appearance. The role of this cell type is to support the plant in axes still growing in length, and to confer flexibility and tensile strength on tissues. The primary wall lacks lignin that would make it tough and rigid, so this cell type provides what could be called plastic support – support that can hold a young stem or petiole into the air, but in cells that can be stretched as the cells around them elongate. Stretchable support (without elastic snap-back) is a good way to describe what collenchyma does. Parts of the strings in celery are collenchyma. Sclerenchyma cells – Sclerenchyma cells (from the Greek skleros, hard) are hard and tough cells with a function in mechanical support. They are of two broad types – sclereids or stone cells and fibres. The cells develop an extensive secondary cell wall that is laid down on the inside of the primary cell wall. The secondary wall is impregnated with lignin, making it hard and impermeable to water. Thus, these cells cannot survive for long' as they cannot exchange sufficient material to maintain active metabolism. Sclerenchyma cells are typically dead at functional maturity, and the cytoplasm is missing, leaving an empty central cavity. Functions for sclereid cells (hard cells that give leaves or fruits a gritty texture) include discouraging herbivory, by damaging digestive passages in small insect larval stages, and physical protection (a solid tissue of hard sclereid cells form the pit wall in a peach and many other fruits). Functions of fibres include provision of load-bearing support and tensile strength to the leaves and stems of herbaceous plants. Sclerenchyma fibres are not involved in conduction, either of water and nutrients (as in the xylem) or of carbon compounds (as in the phloem), but it is likely that they may have evolved as modifications of xylem and phloem initials in early land plants. The major classes of cells differentiate from undifferentiated meristematic cells (analogous to the stem cells of animals) to form the tissue structures of roots, stems, leaves, flowers, and reproductive structures. Xylem cells are elongated cells with lignified secondary thickening of the cell walls. Xylem cells are specialised for conduction of water, and first appeared in plants during their transition to land in the Silurian period more than 425 million years ago (see Cooksonia). The possession of xylem defines the vascular plants or Tracheophytes. Xylem tracheids are pointed, elongated xylem cells, the simplest of which have continuous primary cell walls and lignified secondary wall thickenings in the form of rings, hoops, or reticulate networks. More complex tracheids with valve-like perforations called bordered pits characterise the gymnosperms. The ferns and other pteridophytes and the gymnosperms have only xylem tracheids, while the angiosperms also have xylem vessels. Vessel members are hollow xylem cells without end walls that are aligned end-to-end so as to form long continuous tubes. The bryophytes lack true xylem cells, but their sporophytes have a water-conducting tissue known as the hydrome that is composed of elongated cells of simpler construction. Phloem is a specialised tissue for food transport in higher plants. Phloem cells mainly transport sucrose along pressure gradients generated by osmosis. This phenomenon is called translocation. Phloem consists of two cell types, the sieve tubes and the intimately associated companion cells. The sieve tube elements lack nuclei and ribosomes, and their metabolism and functions are regulated by the adjacent nucleate companion cells. Sieve tubes are joined end-to-end with perforate end-plates between known as sieve plates, which allow transport of photosynthate between the sieve elements. The companion cells, connected to the sieve tubes via plasmodesmata, are responsible for loading the phloem with sugars. The bryophytes lack phloem, but mosssporophytes have a simpler tissue with analogous function known as the leptome. Plant epidermal cells are specialised parenchyma cells covering the external surfaces of leaves, stems and roots. The epidermal cells of aerial organs arise from the superficial layer of cells known as the tunica (L1 and L2 layers) that covers the plant shoot apex, whereas the cortex and vascular tissues arise from innermost layer of the shoot apex known as the corpus (L3 layer). The epidermis of roots originates from the layer of cells immediately beneath the root cap. The epidermis of all aerial organs, but not roots, is covered with a cuticle made of the polyestercutin and/or the hydrocarbon polymer cutan with a superficial layer of epicuticular waxes. The epidermal cells of the primary shoot are thought to be the only plant cells with the biochemical capacity to synthesize cutin. Several cell types may be present in the epidermis. Notable among these are the stomatal guard cells, glandular and clothing hairs or trichomes, and the root hairs of primary roots. In the shoot epidermis of most plants, only the guard cells have chloroplasts. Chloroplasts contain the green pigment chlorophyll which is needed for photosynthesis. This is an electron micrograph of the epidermal cells of a Brassica chinensis leaf. The stomates are also visible. ^ Raven, JA (1997). "The vacuole: a cost-benefit analysis". Advances in Botanical Research. 25: 59–86. doi:10.1016/S0065-2296(08)60148-2. ^ Keegstra, K (2010). "Plant cell walls". Plant Physiology. 154 (2): 483–486. doi:10.1104/pp.110.161240. ^ Oparka, KJ (1993). "Signalling via plasmodesmata-the neglected pathway". Seminars in Cell Biology. 4: 131–138. doi:10.1006/scel.1993.1016. ^ Hepler, PK (1982). "Endoplasmic reticulum in the formation of the cell plate and plasmodesmata". Protoplasma. 111: 121–133. doi:10.1007/BF01282070. ^ Anderson, S; Bankier, AT; Barrell, BG; de Bruijn, MH; Coulson, AR; Drouin, J; Eperon, IC; Nierlich, DP; Roe, BA; Sanger, F; Schreier, PH; Smith, AJ; Staden, R; Young, IG (1981). "Sequence and organization of the human mitochondrial genome". Nature. 290: 4–65. doi:10.1038/290457a0. PMID 7219534. ^ Cui, L; Veeraraghavan, N; Richter, A; Wall, K; Jansen, RK; Leebens-Mack, J; Makalowska, I; dePamphilis, CW (2006). "ChloroplastDB: the chloroplast genome database". Nucleic Acids Research. 34: D692–696. doi:10.1093/nar/gkj055. PMC 1347418 . PMID 16381961. ^ Margulis, L (1970). Origin of eukaryotic cells. New Haven: Yale University Press. ISBN 978-0300013535. ^ Lewis, LA; McCourt, RM (2004). "Green algae and the origin of land plants". American Journal of Botany. 91: 1535–1556. doi:10.3732/ajb.91.10.1535. PMID 21652308. ^ López-Bautista, JM; Waters, DA; Chapman, RL (2003). "Phragmoplastin, green algae and the evolution of cytokinesis". International Journal of Systematic and Evolutionary Microbiology. 53: 1715–1718. doi:10.1099/ijs.0.02561-0. PMID 14657098. ^ Silflow, CD; Lefebvre, PA (2001). "Assembly and motility of eukaryotic cilia and flagella. Lessons from Chlamydomonas reinhardtii". Plant Physiology. 127: 1500–1507. doi:10.1104/pp.010807. PMC 1540183 . PMID 11743094. ^ Manton, I; Clarke, B (1952). "An electron microscope study of the spermatozoid of Sphagnum". Journal of Experimental Botany. 3: 265–275. doi:10.1093/jxb/3.3.265. ^ Paolillo, Jr., DJ (1967). "axoneme in flagella of Polytrichum juniperinum". Transactions of the American Microscopical Society. 86: 428–433. doi:10.2307/3224266. ^ Raven, PH; Evert, RF; Eichhorm, SE (1999). Biology of Plants (6th ed.). New York: W.H. Freeman. ISBN 9780716762843. ^ G., Haberlandt (1902). "Kulturversuche mit isolierten Pflanzenzellen". Mathematisch-naturwissenschaftliche. Akademie der Wissenschaften in Wien Sitzungsberichte. 111 (1): 69–92. ^ abc Cutter, EG (1977). Plant Anatomy Part 1. Cells and Tissues. London: Edward Arnold. ISBN 0713126388. ^ Roelofsen, PA (1959). The plant cell wall. Berlin: Gebrüder Borntraeger. ASIN B0007J57W0. A vital class of membrane proteins are those involved in active or passive transport of materials across the cell membrane or other subcellular membranes surrounding organelles. For a cell or an organism to survive, it is crucial that the right substances enter cells (e.g. nutrients) and the right substances are transported out of them (e.g. toxins). Molecules can cross biological membranes in several different ways depending on their concentration on either side of the membrane, their size and their charge. Some molecules, including water, can simply diffuse through the membrane without assistance. However, large molecules or charged molecules cannot cross membranes by simple diffusion. Charged molecules such as ions can move through channels passively, down electrochemical gradients. This movement is described as ‘downhill’, as the ions or molecules travel from an area of high concentration to an area of low concentration. This requires channel proteins but no energy input. Passive transport can also be mediated by carrier proteins that carry specific molecules such as amino acids down concentration gradients, again without any requirement for energy. Active transport moves species against concentration gradients and requires energy, which is obtained from ATP, from light, or from the downhill movement of a second type of molecule or ion within the same transporter (Figure 6). Figure 6.Passive and active transport. The different types of membrane proteins involved in passive and active transport are shown. Passive transport is the movement of molecules across biological membranes down concentration gradients. This type of transport does not require energy. Channels form water-filled pores and thus create a hydrophilic path that enables ions to travel through the hydrophobic membrane. These channels allow downhill movement of ions, down an electrochemical gradient. Both the size and charge of the channel pore determine its selectivity. Different channels have pores of different diameters to allow the selection of ions on the basis of size. The amino acids that line the pore will be hydrophilic, and their charge will determine whether positive or negative ions travel through it. For example, Ca2+ is positively charged, so the amino acids lining the pores of Ca2+ channels are generally basic (i.e. they carry a negative charge). Channels are not always open. They can be gated by ligands which bind to some part of the protein, either by a change in membrane potential (voltage gated) or by mechanical stress (mechanosensitive). The nicotinic acetylcholine receptor is an example of a ligand-gated ion channel which opens upon binding the neurotransmitter acetylcholine (Figure 7). The nicotinic acetylcholine receptor is a pentameric membrane protein composed of five subunits arranged in a ring, with a pore through the centre. In the closed state, the pore is blocked by large hydrophobic amino acid side chains which rotate out of the way upon acetylcholine binding to make way for smaller hydrophilic side chains, allowing the passage of ions through the pore. Opening of the nicotinic acetylcholine receptor allows rapid movement of Na+ ions into the cell and slower movement of K+ ions out of the cell, in both cases down the electrochemical gradient of the ion. The difference in gradients between Na+ and K+ across the membrane means that more Na+ enters the cell than K+ leaves it. This creates a net movement of positive charges into the cell, resulting in a change in membrane potential. Acetylcholine released by motor neurons at the neuromuscular junction travels across the synapse and binds to nicotinic acetylcholine receptors in the plasma membrane of the muscle cells, causing membrane depolarization. This depolarization of the muscle cells triggers Ca2+ release and muscle contraction. Figure 7.The nicotinic acetylcholine receptor. The pentameric structure of the receptor is shown, with the pore region (P) indicated. Transmembrane helices (M1–M4) are labelled in each subunit. The bilayer is shown in orange. Reproduced from Berridge, M.J. (2012) Cell Signalling Biology; doi:10.1042/csb0001003, with permission. Carrier proteins are the other class of membrane proteins, apart from channels, which can facilitate passive transport of substances down concentration gradients. Carrier proteins transport molecules much more slowly than channels, as a number of conformational changes in the carrier are required for the transport of the solute across the membrane. A molecule such as a sugar binds to the carrier protein on one side of the membrane where it is present at a high concentration. Upon binding, the carrier changes conformation so that the sugar molecule then faces towards the opposite side of the membrane. The concentration of sugar on this side is lower, so dissociation occurs and the sugar is released. This is downhill movement and, although slower than movement through channels, it requires no energy. The cystic fibrosis transmembrane conductance regulator (CFTR) is an ATP-dependent chloride ion (Cl−) channel that has an important role in regulating the viscosity of mucus on the outside of epithelial cells. ATP is used to gate the channel, but the movement of Cl− occurs down its electrochemical gradient, so does not require energy. A heritable change in the CFTR gene which results in a single amino acid deletion in the protein causes cystic fibrosis. This is a serious illness in which thick mucus accumulates in the lungs, causing a significantly lower than average life expectancy in patients who have the disease. Unimpaired ion transport is vital for our survival and health, and conditions such as cystic fibrosis highlight the need for research into these types of proteins. The transport of molecules across a membrane against a concentration gradient requires energy, and is referred to as active transport. This energy can be obtained from ATP hydrolysis (primary active transport), from light (as, for example, in the case of the bacterial proton pump bacteriorhodopsin), or from an electrochemical gradient of an ion such as Na+ or H+ (secondary active transport). Calcium ions signal many events, including muscle contraction, neurotransmitter release and cellular motility. However, high cytoplasmic concentrations of Ca2+ are toxic to the cell. Therefore Ca2+ must be tightly regulated and removed from the cytoplasm either into internal stores (the ER, and the SR in muscle cells) or into the extracellular space. This Ca2+ removal is carried out by a family of Ca2+-ATPases, including the sarco/endoplasmic reticulum Ca2+-ATPase (SERCA), which hydrolyse ATP to move Ca2+ against its electrochemical gradient into the ER and SR (Figure 8). There are Ca2+-ATPases in the ER, Golgi and plasma membrane, and despite their sequence similarity, these proteins are differentially targeted to the appropriate membrane. These Ca2+ pumps are primary active transporters. SERCA moves two Ca2+ ions into the ER or SR for every ATP molecule that is hydrolysed. The pump undergoes a cycle of binding ATP and phosphorylation, and undergoes large conformational changes every time it transports a pair of Ca2+ ions. SERCA is a P-type ATPase (so called because it is phosphorylated during ion transport). There are many P-type ATPases, and they are conserved in evolution across many species. The Na+/K+-ATPase is one of these P-type ATPases, and it works in a similar way to SERCA to pump Na+ out of the cell and K+ into the cell using energy derived from the hydrolysis of ATP. We have now obtained three-dimensional structures of SERCA in a number of conformational states, which allow scientists to visualize the transport process. Figure 8.The sarco/endoplasmic reticulum Ca2+-ATPase (SERCA). The crystal structure of SERCA in the ADP- and Ca2+-bound state is shown. D351 (in red) is the residue phosphorylated during the movement of Ca2+ ions into the ER or SR. The three cytoplasmic domains, phosphorylation (P), nucleotide binding (N) and actuator (A) are labelled. ADP is shown in yellow and Ca2+ ions in green. Protein Data Bank (PDB) code 2ZBD, rendered using PDB Protein Workshop. Secondary active transport requires an ion electrochemical gradient to drive the uphill transport of another solute. The downhill movement of one species drives the uphill movement of the other. This can be symport (in which both types of molecule or ion travel across the membrane in the same direction) or antiport (in which the two species travel in opposite directions), as shown in Figure 9. The two types of co-transport are shown, with examples. In order to transport glucose into cells, the Na+–glucose symporter uses the electrochemical gradient of Na+ across the plasma membrane. The concentration of Na+ is much higher outside the cell, and the inside of the cell is negatively charged relative to the outside, so by allowing Na+ to travel down its electrochemical gradient, these transporters can move glucose uphill, into the cell and against its concentration gradient. This is referred to as symport, as both Na+ and glucose travel in the same direction—in this case into the cell. In order for this symport to be sustainable, the Na+ gradient must be maintained. This is done by the Na+/K+-ATPase, which uses ATP to pump the Na+ back into the extracellular space, thus maintaining a low intracellular Na+ concentration. Both Na+ and Ca2+ are present at much higher concentrations outside the cell than inside it. Like the Na+–glucose symporter, the Na+–Ca2+ exchanger uses the electrochemical gradient of Na+ across the plasma membrane to move a second species (Ca2+) against its electrochemical gradient. However, in this case the transporter is an antiporter, as it uses the concentration gradient of one substance moving in (Na+) to move another (Ca2+) out of the cell. This antiporter has an exchange rate of three Na+ ions in to two Ca2+ ions out. It moves Ca2+ out of the cell faster than the plasma membrane equivalents of SERCA, but has a lower affinity for Ca2+ than these P-type ATPases. Again this transporter relies on the Na+/K+-ATPase to maintain the low intracellular Na+ concentration.